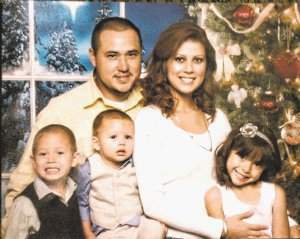 Circumstances: The children are believed to be in the company of their mother, Elizabeth Rojo. They may have left the country and traveled to Mexico. It is believed that the children are in the company of their mother, Elizabeth Rojo, pictured below. The California Highway Patrol has issued an emergency missing advisory for three children. It could be upgraded to a full Amber Alert. Elizabeth Rojo, age 24, took her daughter 6 year old Eveny Felix, , and sons 5 year old Miguel Felix, and 2 year old Louis Felix, after her first unsupervised visit in about a year. The visit was at a McDonald’s on Date Palm Drive in Cathedral City, California. When the social worker returned to pick up the children Rojo and the kids were gone. According to authorities Rojo lost custody of her children last year after an attempted suicide. Rojo was caught speeding with her children in the car. She intended to take her own life. Police released family photos and continued their hunt Thursday for a woman and her three children she is suspected of abducting. Meanwhile, it was unclear why an employee of Child Protective Services, which has had custody of the children since last year, waited two hours before calling police to report them missing. Elizabeth Rojo, 24, took her daughter, Eveny Felix, 6, and sons, Miguel Felix, 5, and Louis Felix, 2, after a Wednesday afternoon visit at McDonald's on Date Palm Drive in Cathedral City, police said. I don't get unsupervised !! This is such a scary story. Hope good news is possible out there. The felix children are still listed as missing. The siblings have been missing for just over 2 years..
Louis would now be 4 years old.